departments Staff Nurse, Pharmacist, ANM, Ayurveda Medical Officer, Lab Technician and other posts through merit in educational qualifications. 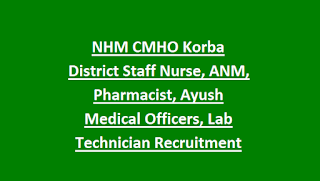 There are total 121 vacancies available in this NHM Korba District CMHO ANM Staff Nurse recruitment. Candidate who having sufficient educational qualifications they can attend the walk in interview from 26-09-2018 to 01-10-2018 along with the self attested copies of registration certificates, qualifications, DOB certificate, caste certificate, previous work experience and if any other required documents. Candidates will be selected based on their marks percentage in educational qualifications only. A merit list/Short list will be prepared based on candidate marks for CMHO Korba NHM ANM Staff Nurse recruitment. Those candidates only called for the certificate verification. Last date to reach the application to NHM CMHO Korba district is 01-10-2018. 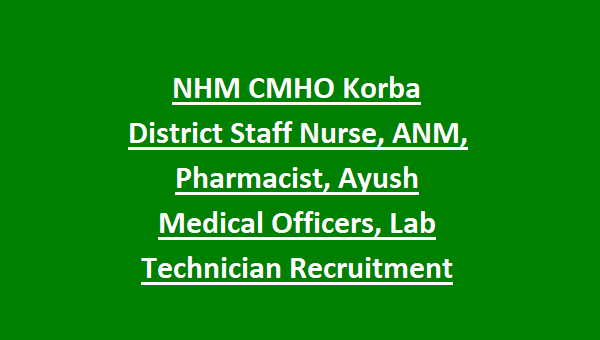 For more information regarding National Health Mission of Korba District Staff Nurse,Pharmacist, ANM, Ayurveda Medical Officer Jobs recruitment through CMHO details are given below.. Walk interview dates for NHM Korba is 26-09-2018 to 01-10-2018. Age limits as on 01-01-2016 for all the posts is 18 years to 65 years. For all the posts application fee is Rs.400/- for general, OBC candidates and Rs.200/- for SC/ST/PH and Female candidates of all categories. Candidates have to pay this amount through DD in favor of " Chief Medical and Health Officer, Korba District, korba DHS Bank Account (NRHM FUNDS) Korba" payable at Korba. For more details refer the official notification and then take DD. Selection for this NHM, NUHM, NCD various jobs will be based on merit in educational qualifications and previous work experience. Merit list/Short list will be prepared based on qualifications and experience. Candidates whose name on merit lists, those are only called for the personal interview and certification verification. Eligible criteria having candidates can attend the walk in interview along with all necessary documents to CMHO Korba District from 26-09-2018 to 01-10-2018. Please cross verify the address with official notification. Download application form and notification here for Korba District NHM CMHO Jobs.